What's the right sports shoe for you? The foot plays a large part in getting us places doesn't it? Right from physical locomotion to self-reliance (standing on one's own feet). Throughout the day, be it walking to the bus stop or climbing stairs or even tapping away to some funky beats in a cafe, it's the feet that make it all possible. Needless to say, they go through a lot everyday. Greater physical exertion like sport requires various muscles and tendons to work in tandem with the calf, ankle and the leg. Getting the right shoe for your kind of foot and physical activity is hence crucial to the prevention of any impact and stress injuries. Read on to figure out the finer nuances of picking the right shoe for your needs. It all starts with the shoe being the perfect fit for your foot. Shoes differ in their shape and fit and one universal size might not be an ideal fit across brands. Assess if you have a wide or narrow foot. Take into account that the kind of socks you would be wearing the shoe with. Try them on with the same kind, be it a nylon or cotton pair of socks. Once worn, there should be enough room to move your toes within the shoe. Shoes these days are designed for specific sporting or lifestyle needs. So wearing your running shoes for a game of basketball might seem convenient but it could turn into an injury nightmare. Shoes are made considering the requirements of the sport, so a basketball shoe has good ankle support, while a cross trainer has restricted flexibility and good cushioning. A running shoe has neither, but is the most flexible. So choose the appropriate shoe for your needs even though it might cost you a bit more. At least it will be a preferred option to bearing the anguish and cost of treating any possible injury. The next time you are out sweating it playing your favorite game, observe your movements acutely. 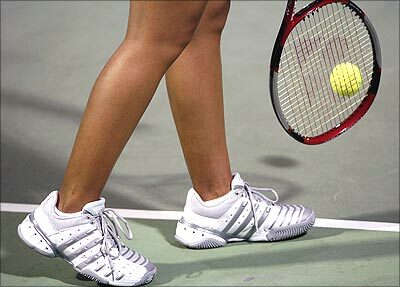 Certain sports played on hard courts like tennis, badminton or squash would require a shoe with greater lateral support. Since these sports involve abrupt deceleration and lunging these shoes will have a tougher front exterior and good traction on court. If your preferred workout is at the gym, cross trainers might best fit your bill. Cross trainers offer great arch support with a good degree of cushioning. This shoe is meant to adapt to multiple forms of workout: be it aerobics, treadmill-running or weight training. Says Abhijit Dutta, 24, Manager, Corporate Relations P&G; "I had purchased these light-weight flexible running shoes for my daily run. I used to run on a dirt track in a nearby park. My job had me relocate to another city where my only option was running in a nearby lane. My shoes that were perfect for the dirt track just did not provide enough support on such a surface. I had to opt for shoes with firmer support to cushion the impact." How is one ever to choose? The answer is surprisingly simple. Wear the shoe and walk around in it. Try and simulate the kind of movement that the sport will involve to check for comfort. 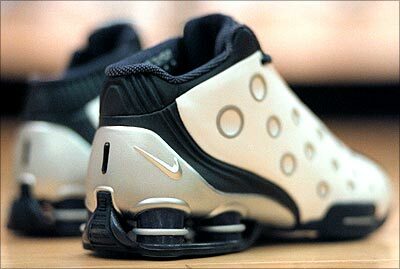 There are multiple technology platforms that have been patented by various shoe brands. Running: High flexibility, lightweight, low ankle, moderate cushioning. Tennis/Squash: Moderate Flexibility, pronounced arch support, gum soles, rugged front exterior. Basketball: High ankle support, high cushioning, moderate flexibility, broad sole. Cross training: High lateral support, high cushioning, moderate flexibility. Says Sayyad, salesman at a branded showroom in Bangalore: "Most people sacrifice comfort at the cost of a better looking shoe. They are not too concerned about the technology that goes into the shoe." Personally, I believe the best way to take the look element out of the equation is to choose the kind of shape and technology that suits your foot and then find the best match look-wise. Invariably, the shoes that you love are the ones you simply cannot afford. Something's got to give; either you settle for a lesser shoe or over exceed your budget. In case of making a compromise, try choosing the lightest shoe in your price and comfort range. 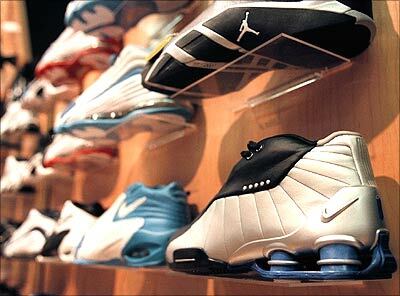 A good way to get the best of both worlds is to purchase the shoe of your choice from a factory outlet. The discounts can stretch up to 60 per cent at times and are usually applicable on the higher end shoes. The only flip side is there is no exchange or return possible in the odd chance of a defect. So inspect your pair closely before you bill it. If you are a first time buyer or are unsure about the comfort of the shoe before wearing it for a few hours, prefer buying the shoe from a company showroom. They usually have accommodating exchange policies in case you find the shoe unsuitable. 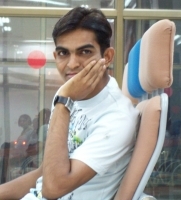 "I always prefer buying my shoes from a factory outlet. I can get a lot more for my budget, and so far I have not experienced a functional problem with the shoes," says Harsh Taneja, 25, a media professional working with BBC, Mumbai. The workout sessions are worthwhile for everyone because you get a fit and active body and the best thing is that the workouts make you look younger. I am so happy that I follow my routine very strictly. I also wear high quality shoes along with my colorful and Designer Leggings as well as tops that truly make me inspired everyday!